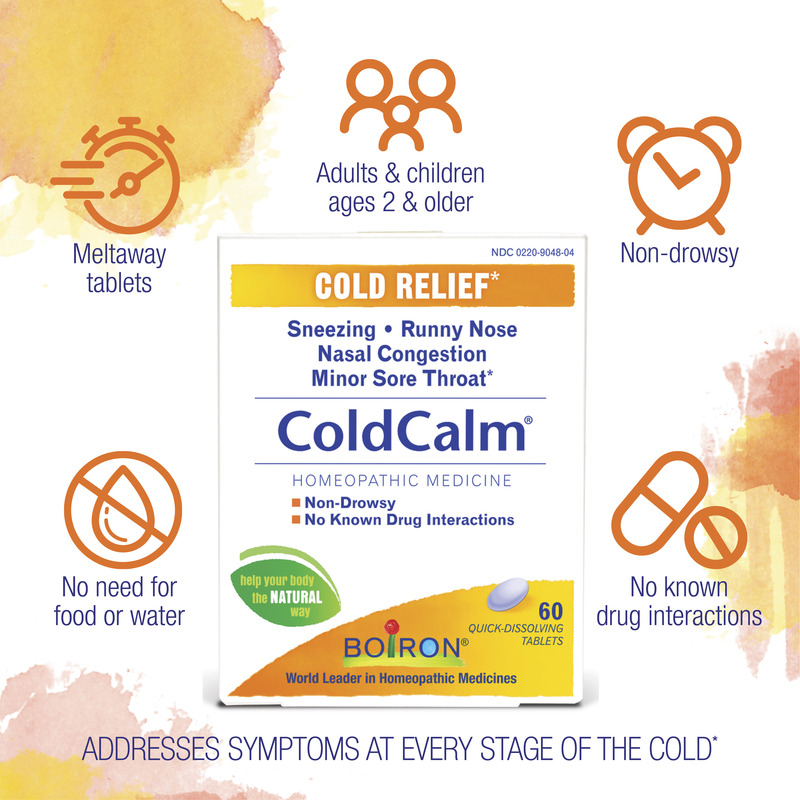 ColdCalm (Cold Relief) by Boiron work once you've gotten ill. I've used ColdCalm by Boiron for years...always pleased with the results! Coldcalm addresses the symptoms at every stage of a cold‚ such as sneezing‚ runny nose‚ nasal congestion and minor sore throat. It does not cause drowsiness or interact with other medications. Recommended for everyone ages 3 and up. - Temporarily relieves cold symptoms such as sneezing‚ runny nose‚ nasal congestion and minor sore throat. - For everyone ages 3 & up. Allium Cepa 3C HPUS / Relieves sneezing and runny nose. 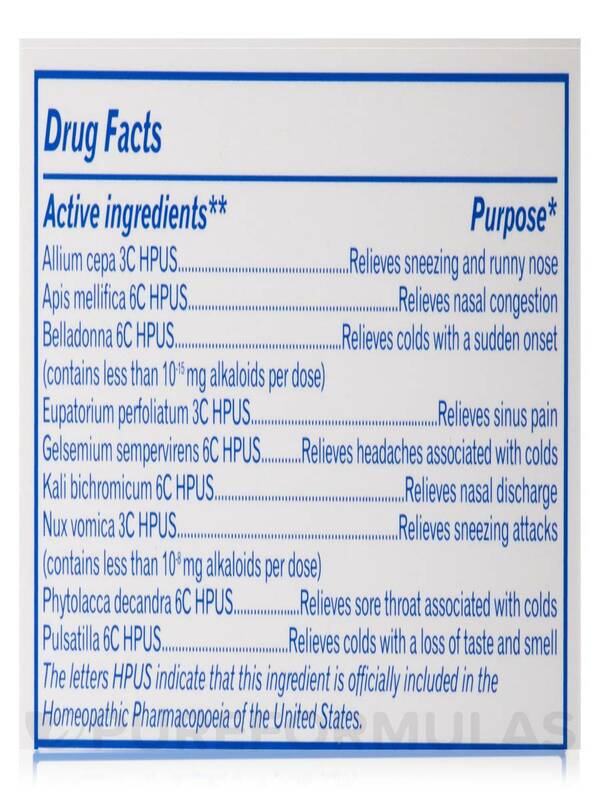 Apis Mellifica 6C HPUS / Relieves nasal congestion. Belladonna 6C HPUS (Contains less than 10mg alkaloids per dose) / Relieves cold with a sudden onset. Eupatorium Perfoliatum 3C HPUS / Relieves sinus pain. Gelsemium Sempervirens 6C HPUS / Relieves headaches associated with colds. Kali Bichromium 6C HPUS / Relieves nasal discharge. 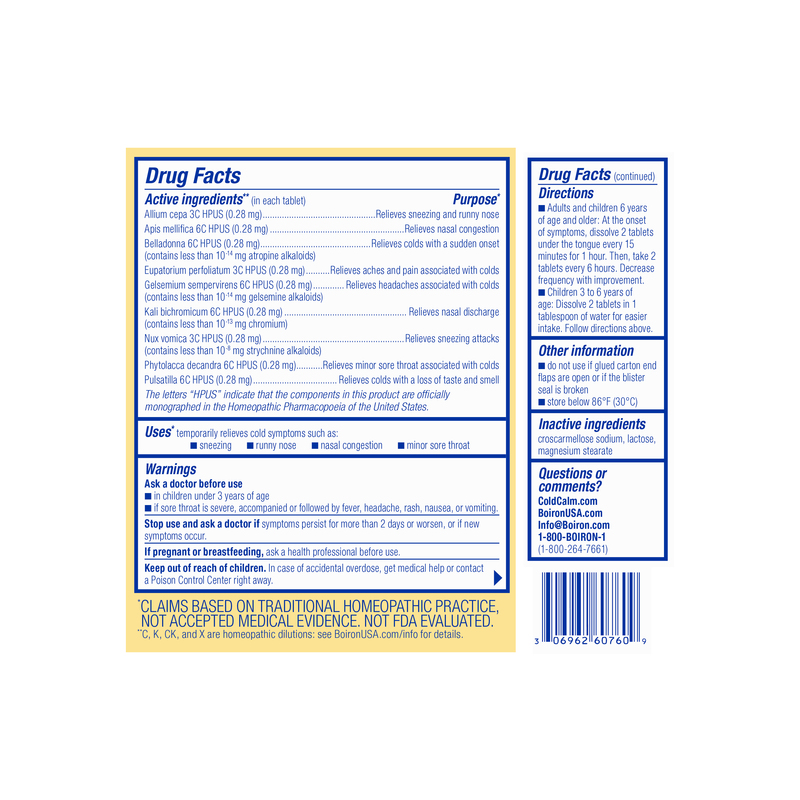 Nux Vomica 3C HPUS (Contains less than 10mg alkaloids per dose) / Relieves sneezing attacks. Phytolacca Decandra 6C HPUS / Relieves sore throat associated with colds. Pulsatilla 6C HPUS / Relieves colds with a loss of taste and smell. Adults and children 3 years of age and older: At the onset of symptoms‚ dissolve 2 tablets under the tongue every 15 minutes for 1 hour. Then‚ dissolve 2 tablets under the tongue every 2 hours until symptoms are relieved. 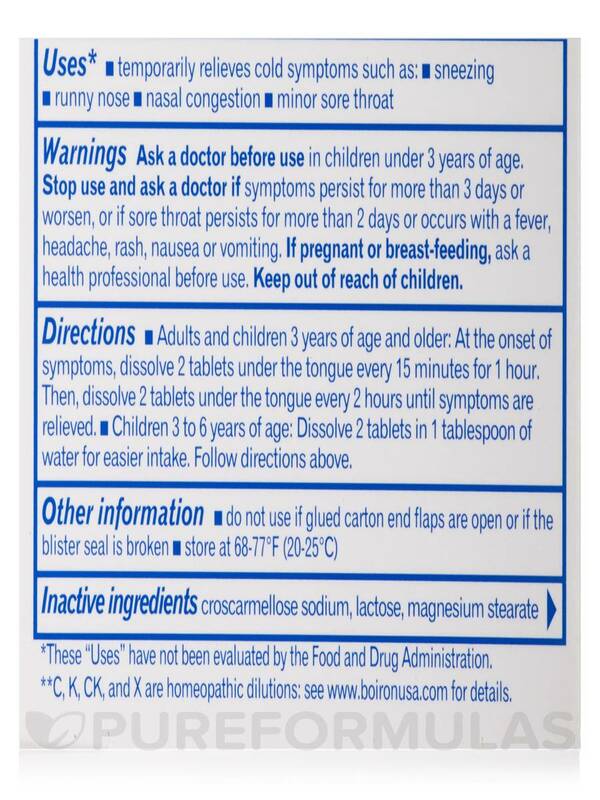 Children 3 to 6 years of age: Dissolve 2 tablets in 1 tablespoon of water for easier intake. Ask a doctor before use in children under 3 years of age. Stop use and ask a doctor if symptoms persist for more than 3 days or worsen‚ or if sore throat persists for more than 2 days or occurs with a fever‚ headache‚ rash‚ nausea or vomiting. If pregnant or breast-feeding‚ ask a health professional before use. Keep out of reach of children. Do not use if glued carton end flaps are open or if the blister seal is broken or missing. Store at 68-77°F (20-25°C). Start ColdCalm at the first sign of a cold and you can stop the cold in it’s tracks or at least lessen symptoms and length of it. Use as directed on box for best results. It works but you have to take it at the FIRST sign of a cold. If you don’t treat symptoms immediately, it doesn’t work as well. I have not yet used the Cold Calm I ordered but was given some by a friend and I thought it worked. I bought this to have on hand for the next cold. 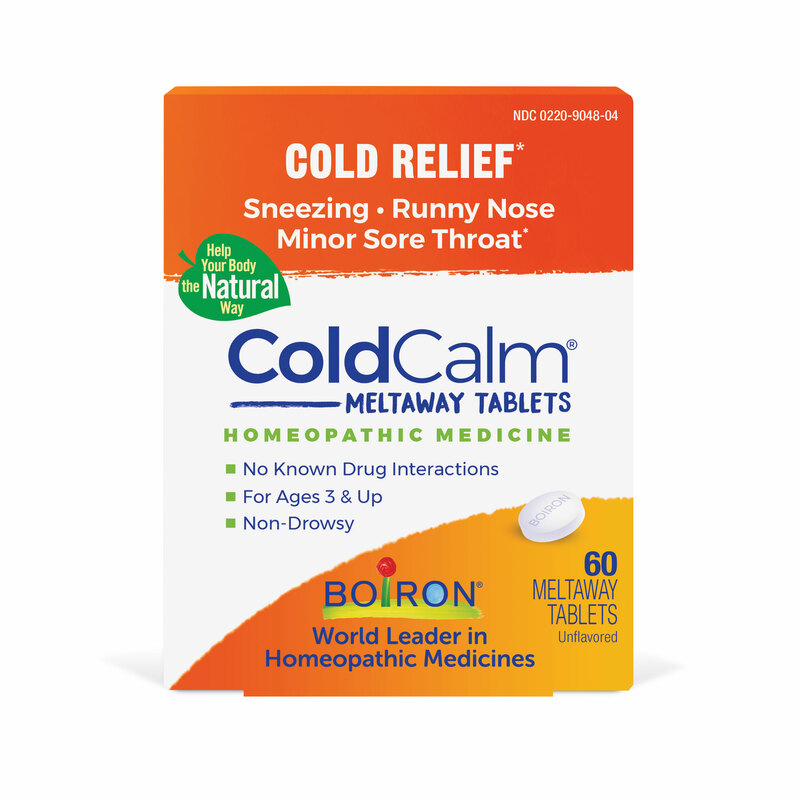 ColdCalm (Cold Relief) by Boiron works well when taken at first sign of a cold. 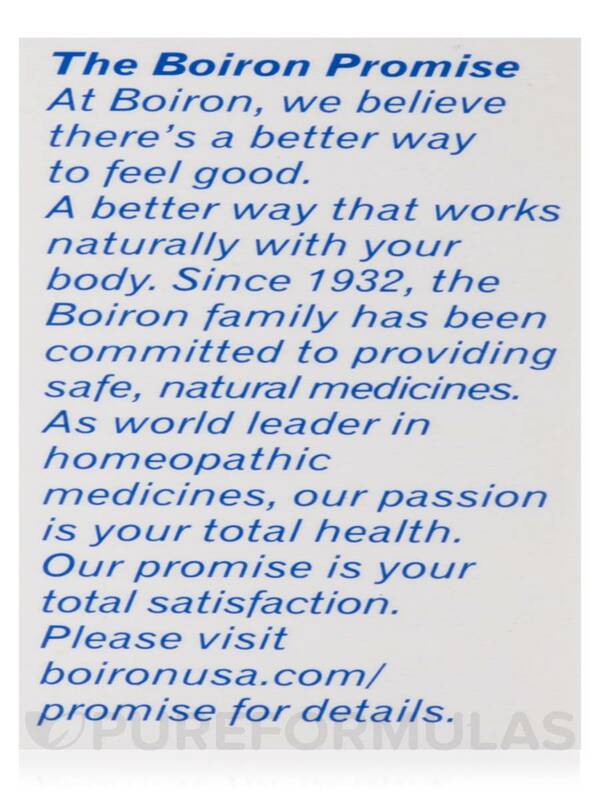 Boiron makes great products. Helps your body to nip a cold in the bud and fight it off. 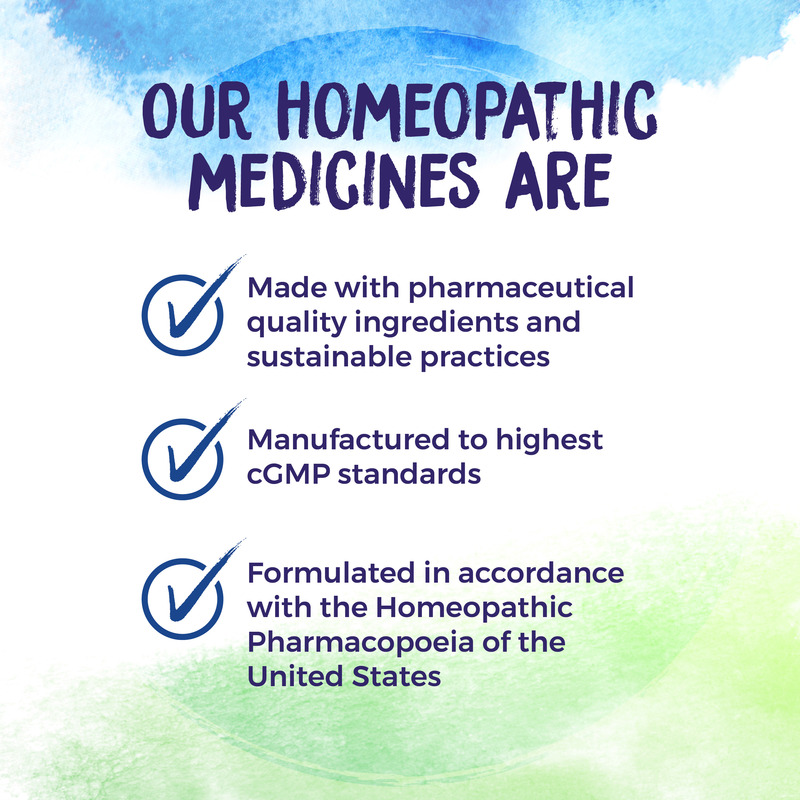 Just like any homeopathic remedy, the remedy has to match the symptoms one is experiencing. Not really a con, just something to be aware of. It's not necessarily a one size fits all. I will not be without ColdCalm by Boiron. At the first sign of a cold I take this product. I feel that is cuts the duration of the cold. ColdCalm works when taken at first signs of symptoms. 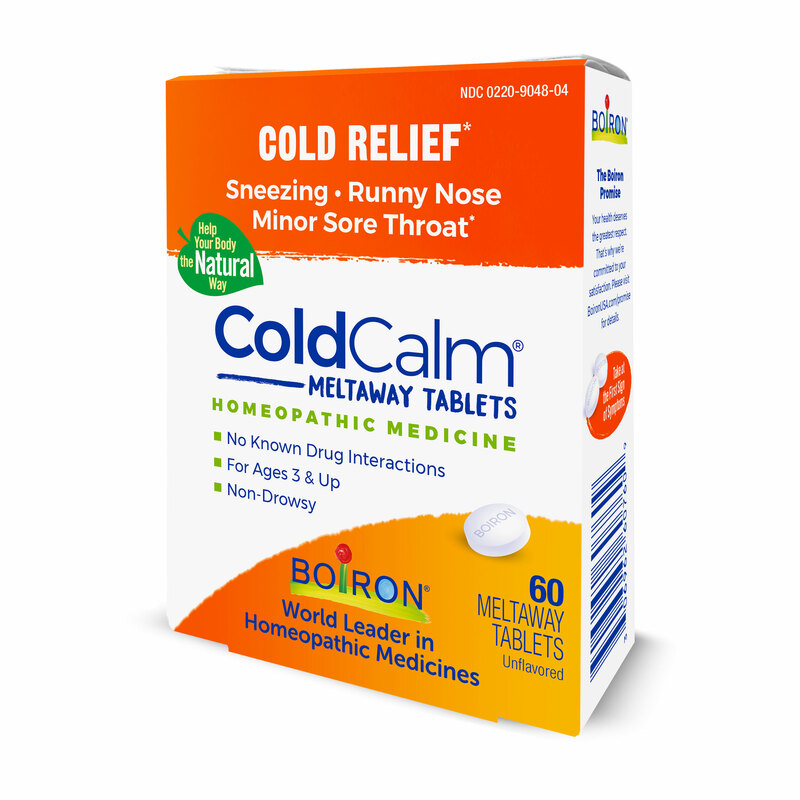 Every time I feel like I am getting a cold I start taking ColdCalm (Cold Relief) by Boiron and they work every time. Taking them for one day does the trick for me. I keep a box at my desk and one in my night stand. Unbelievable! Easy to take under the tongue. 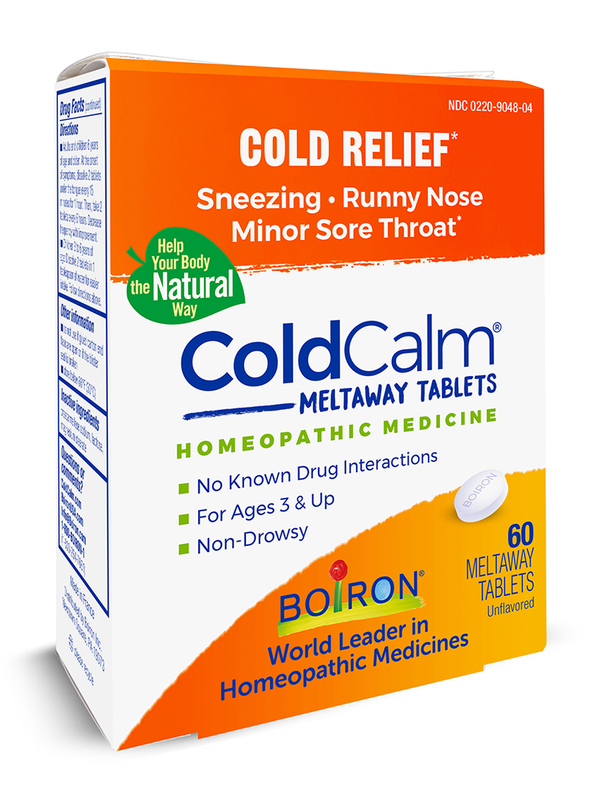 I really believe in ColdCalm (Cold Relief) by Boiron. They shorten colds and lessen symptoms. You MUST have them on-hand when symptoms start! Don't be caught off guard! They are a bit spendy, and you have to take them every 15 minutes, which can be difficult when you wake up in the middle of the night with the first signs of symptoms. It works, does not taste bad, is easy to use. 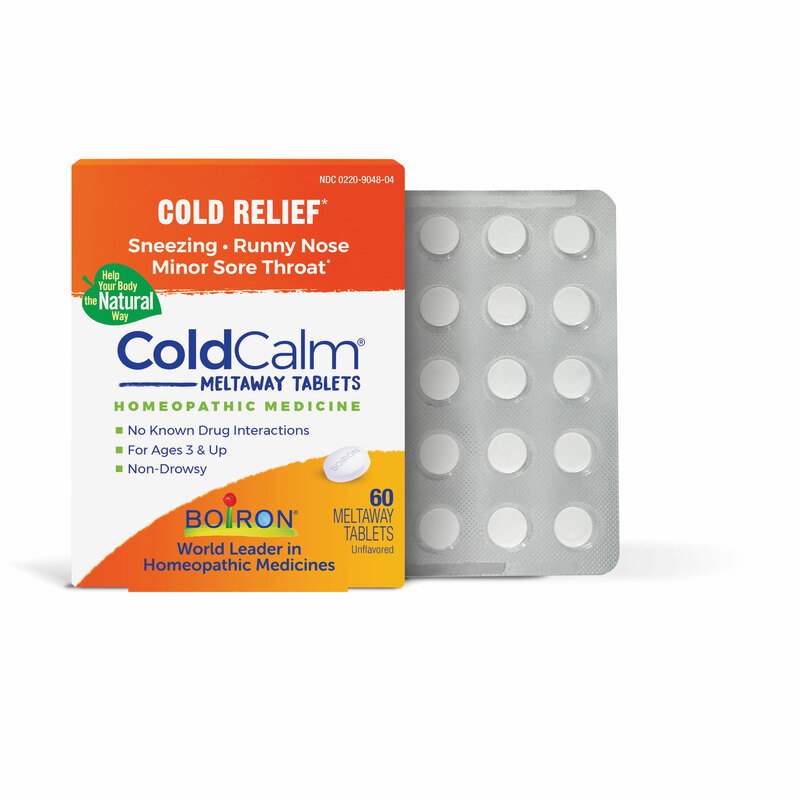 I start taking ColdCalm (Cold Relief) by Boiron at the first sign of getting a cold and it seems to work at preventing it from turning into a full blown cold. How many can you take in 24 hours? Hi Sarah, we do ask to speak to your health care practitioner to know safely and accurately exactly how many you can take in 24 hours. The recommended dosage does say to dissolve 2 tablets under the tongue every 15 minutes for 1 hour. Then dissolve 2 tablets under the tongue every 2 hours until symptoms are relieved.